With the heat of summer lasting most of the year and our winters are temperate, it makes sense to make the most of the outdoor area. Great for entertaining, as well as spending time with family, a Unique Design alfresco outdoor kitchen is perfect for Brisbane's lifestyle. Our stunning outdoor BBQ's are custom designed to suit your needs and budget. Come and visit our showroom and see our Alfresco Outdoor Kitchen display. These ideas can revolutionise the way you experience your outdoor kitchen – and your dinner parties. A well designed outdoor kitchen takes the enjoyment of social occasions to a whole new level. We invite you to drop by our showroom to inspect our range of kitchens, bathrooms and outdoor BBQ's. Talk to our knowledgeable staff to help you design the best outdoor kitchen using the most appropriate materials. Brisbane experiences some of the best weather in the world. While summer is the peak tourist season in southern Queensland, our winters are temperate and ideal for spending time outdoors. People come from all over to enjoy our pristine beaches, abundant sunshine, and outstanding shopping centres. If any of these people are your friends and family members, then you’re likely on the hook for some entertaining. You’re a good host, but even your skills can become overtaxed when it comes to housing, feeding, and entertaining a full house of relatives and friends. Multiple nights out at restaurants and dinner theatres can get expensive. The solution for engaging your guests while keeping your sanity may be right outside your home’s back door. You may not know this, but Unique Design has its roots in kitchen renovations. 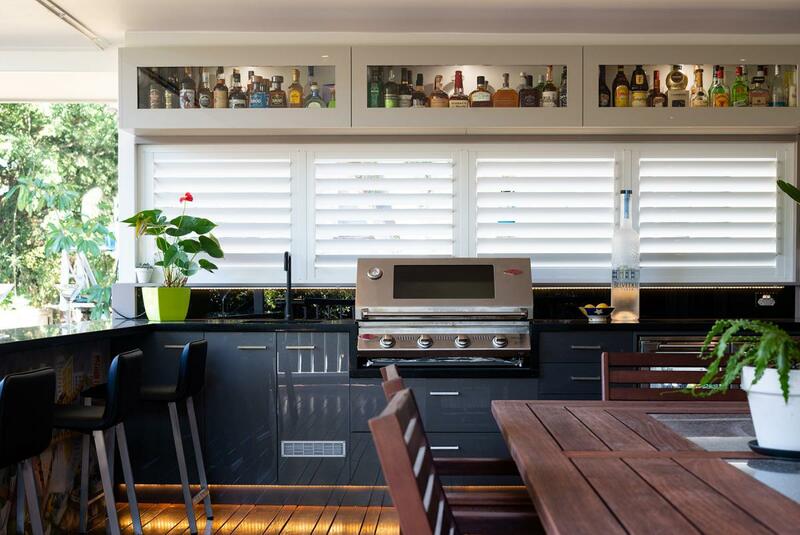 We use our 20-plus years of kitchen design experience to create functional, pleasing Brisbane outdoor kitchens. Cooking and eating outside have always been appealing activities to most Brisbane residents. The days of rolling out the portable charcoal grill and eating hamburgers on rickety folding chairs are over for many people. They’ve discovered the fun and convenience of alfresco-style kitchens. You too can make the most of your backyard with an alfresco kitchen by Unique Design. At Unique Design, it all starts with an in-home consultation. We specialise in listening to your vision for your backyard kitchen. Some clients want an intimate space where they can prepare a variety of meals for a few guests, but others need a full-service, backyard kitchen that includes lots of seating and all the appliances of a standard, indoor kitchen. After we get an idea of how you want to use your new kitchen, our designers use multimedia tools to create drawings of the space. Our 3-D imaging software allows you to get a complete view of our proposed designs. Early in the process, you’ll notice things that you love and items that you want to change. As part of the design process, we propose the materials that work best in your new space. We partner with suppliers to give you different styles of natural stone, granite, and tile for your kitchen’s flooring and benchtops. Weather-resistant cabinetry and appliances are also included the package. We make sure to offer you quality kitchen materials at different price points to give you the most control over your project’s budget. You get the backyard kitchen that you want without the surprises of hidden costs. After you approve our plan for your al fresco kitchen, we give you a cost estimate and proposed project schedule. We’ll begin work on your backyard kitchen when it’s convenient to you. You can expect our team of installers to get any permits that you’ll need for your new kitchen, and they construct your backyard kitchen to the exacting standards of our industry. We stay abreast of innovations in layouts, appliances, fixtures, and finishes for outdoor kitchens, and we’re affiliated with the Kitchen and Bathroom Designers Institute, the Housing Industry Association, and the Queensland Building and Construction Commission. Our team of installers keep you informed about your project from start to finish. Your concerns are our priorities. We take care of the small details that make the difference between a stressful renovation and an exciting backyard transformation. We finish by tidying work spaces so that your new outdoor kitchen is ready to make its début at your next dinner party. In today’s economy, many residents of Brisbane are counting their blessings and deciding to stay in their homes. Rather than moving to a newer house in a questionable neighborhood, a homeowner may upgrade their current property to accommodate a growing family or many guests. A cost-effective and practical way to get more out of your property is to convert your backyard into a functional, stylish outdoor living area. While a backyard kitchen will undoubtedly be the hub of activity in your new outside living space, it’s not the only element of the space. Modern backyards often feature pools, lounge seating, and gazebos. If you have small children, you may have plans to build a custom play area that allows you keep one eye on the kids and the other on your shish kabobs. Imagine your children being able to stop playing, wash their hands, and immediately sit down to a freshly cooked meal just in time to catch the evening sunset. If you plan to use your backyard for frequent dinner parties, you might choose to install different types of seating. You can get seating options that are both attractive and weather resistant. Placing sectional sofas, chairs, and benches in cosy groups throughout your backyard is a great addition to the bar stool chairs that are usually included in a backyard kitchen. These areas encourage conversation and overall fun for your entire party. You might have these seats situated around fire pits, water features, or a movie projection screen. At Unique Design, we consider our clients’ current needs and future dreams. We create outdoor kitchens in Brisbane that grow with you. We ask the right questions during the design process to find out your plans for your entire backyard and not just your kitchen. Those plans are important to know because we like to make our proposed kitchen designs fit seamlessly into your lifestyle. If you want to turn your backyard into the community’s outdoor theatre, we want to make sure that your kitchen accommodates a professional-grade, outdoor sound system. There’s no need for you to miss the good parts of the movie just because you’re filling up your plate in your backyard kitchen. We pay attention to the details that other companies may overlook so that you get the backyard kitchen of your dreams. We consider your plans for landscaping, hardscapes, vegetable gardens, and all forms of backyard entertainment when it comes to designing and installing your backyard kitchen. Installing a backyard kitchen is a popular option for homeowners who live on the Gold Coast. This home improvement increases quality of life in many ways. While Brisbane’s restaurant scene is lively, home-cooked meals are usually better for your wallet and waistline. With an alfresco-style kitchen, you’ll have plenty of incentive to prepare you meals at home. Our kitchen designs include expert lighting that make it enjoyable to prepare and eat your meals under the stars. We only recommend state-of-the-art appliances for your new kitchen. You can get a miniature or full-size refrigerator, a stainless-steel BBQ, and an ice maker for your space. Other backyard kitchen appliances include pizza ovens, griddles, and range hoods. These items do well and look great. They are just what you need for dinner parties with family, friends, and co-workers. A well-designed backyard kitchen is often a recipe for good relationships with your neighbors. Regularly inviting them to your dinner parties will make them feel liked and appreciated. You could prepare the meals, or you could have everyone bring their favourite entrées. Your neighbors would likely enjoy the opportunity to cook their specialty dishes in your new backyard kitchen. The great thing about having meals in your backyard kitchen is that you don’t have to worry about buying fancy furnishings and accessories for indoor living areas to impress your guests. Since you’ve decided to take your soirée outside, your guests will have limited access to your home. This is ideal for homeowners who love to entertain but value their privacy. At Unique Design, we can create a backyard kitchen that meets your needs for convenience and aesthetics. This includes installing sinks where guests can wash their hands before eating and laying in ample cabinet space so that you can spend more time conversing with your friends and family and not running back indoors to hunt for cookware, dishes, and utensils. Our backyard kitchens encourage a healthier lifestyle for our clients. According to the World Health Organization, obesity is a big problem in Australia. In recent years, Australia had the third-highest number of obese adults in the English-speaking world. One in four of Australia’s children are obese. We believe that frequent trips to restaurants and sedentary indoor activities contribute to these disturbing statistics. Having a backyard kitchen makes eating at home fun again, and you control the ingredients for your family’s meals. Eating outdoors also encourages your children to put down smartphones and video game joysticks for a short time and play games outdoors. Your investment in one of our outdoor kitchens Brisbane can make your life easier. In addition to saving you money on frequent trips to restaurants, a backyard kitchen saves you time when it comes to cleaning up after parties. Since your guests won’t be exploring your entire house with dinner, drinks and desserts, you don’t have to spend half of the next day bringing order back to your abode. Unique Design creates alfresco-style kitchens that include durable, easy-to-clean fixtures and appliances. We install sealed cabinets, drawers, and appliances that resist leaks during rainy weather. You can even get a dishwasher in your new backyard kitchen. It’s all up to you. The design options for these al fresco living areas are nearly endless. Hot and sunny are the words to describe typical summers in Brisbane. While it’s great beach weather, the high temperatures can make your utility bills soar to new heights. This is especially true if you prepare all your family’s favourite meals indoors. With a custom backyard kitchen, you can prepare the baked, grilled, and fried dishes that your family loves without causing your air conditioning unit to work overtime. You’ll also love that your home remains free of cooking odors. Popular seafood dishes that many of our customers love are best prepared, cooked, and eaten in a backyard kitchen. In recent years, real estate brokers throughout the country have noticed how popular alfresco-style kitchens are with home buyers. This trend is relevant for houses that are in moderately priced communities as well as those that have addresses in upscale neighborhoods. Mr. Alex Ouwens, Real Estate Institute of SA president, said that backyard kitchens that are installed on the right properties increase home values. He mentioned that they are popular with growing families and with couples who want to downsize. Everyone seems to love these outdoor room additions that show off beautiful views and landscaping to advantage while guests dine in the fresh air. Our region is famous for its stunning scenery, and most residents don’t want to leave. Relocation for career advancement or family obligations make leaving the Gold Coast a reality for some homeowners, however. Installing a well-appointed backyard kitchen gives you plenty of enjoyment now, and it could help you to sell your home quickly if you ever needed to move. We don't need to tell you that all backyard kitchens are not built to the same quality design and construction standards. At Unique Design, we partner with trusted brands to deliver beautiful alfresco-style kitchens that last for years. You’ll cherish the easy convenience of your Brisbane outdoor kitchen, which will surely be the setting for many memorable moments.